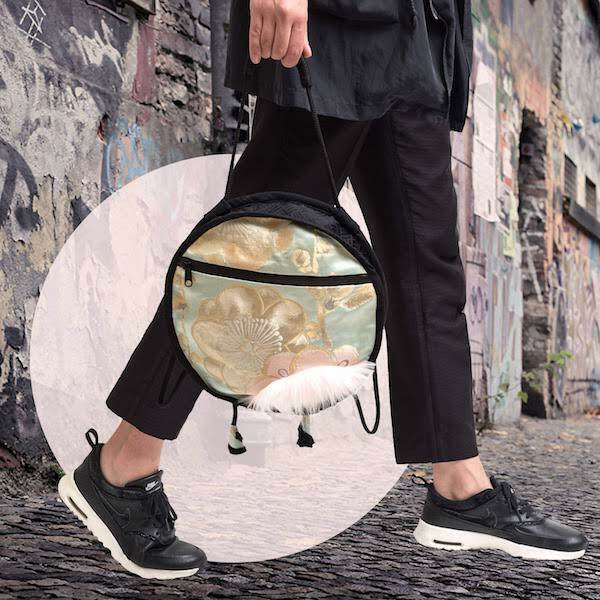 Fashion knows no borders – Mikan, the brand of Française Clémentine living in Kyoto, proves that like no other. 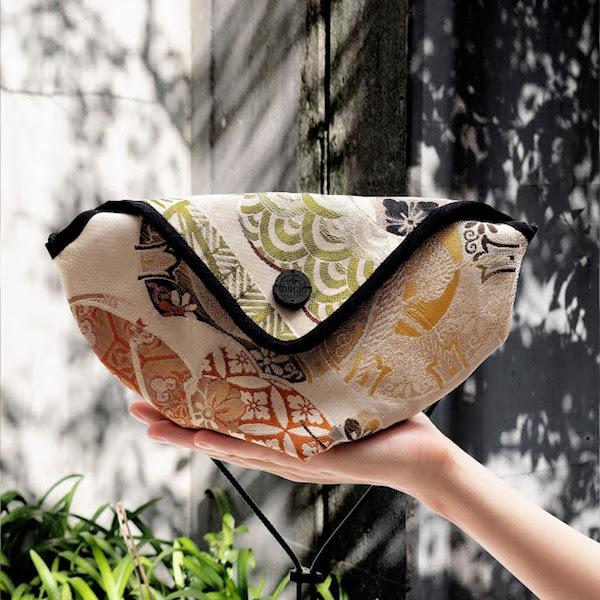 She makes handcrafted bags and accessories from precious Japanese textiles, giving them a second life. I had the chance to interview her and get the story behind her brand – read it below and have a look at these one-of-a-kind items! 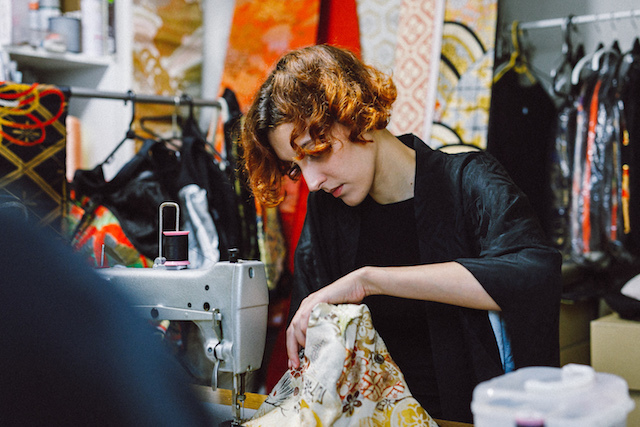 I have always been fascinated by the idea of making clothes – creating something unique from scratch. As a little girl, before I even knew what “fashion” was, I loved looking at my grandmothers who were always sewing and knitting. I could literally watch them for hours, and asked them to teach me how to make clothes for my dolls. This fascination continued all the way to University, where I kept designing clothes as a hobby. I had a sewing atelier with my roomate in our shared house, where I took orders from friends and family. After a while I realized that making clothes is what I want to do in life. So I decided to leave university and study fashion. How did you get to Japan? Once I had my fashion degree in my pocket, I moved from France to London to work in a design studio. I stayed there only for 3 months though, because I got shortlisted for an international ethical fashion contest (the Redress Design Award) in Hong Kong and moved there for a while. It was a great experience after which I moved back to Europe – but not for long. After the competition my school in France invited me for a one year post-graduate program in their Tokyo branch. The initial idea was to return to France afterwards, but I fell in love with Japan and never left! I would describe my products as wearable collectibles. 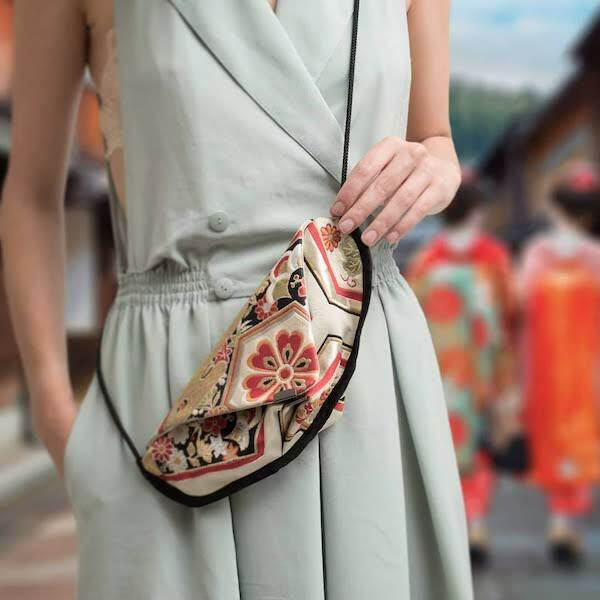 Nowadays you can print anything on textile but when you see these antique Japanese fabrics, you can see that they are from another time, that they carry a rich culture and a great beauty. And they were all handmade, so you can feel the craftsmanship and hours of work behind them. I’m always amazed to find these treasures with a soul, and love giving them a second life. My ‘adopted’ city, Kyoto, is an infinite source of inspiration. The city is famous for its traditional rich culture but it is also very much energized by the drive of local creatives to modernize it, with much respect to the past. The Japanese esthetique is very unique to me and that’s why it is so present in the materials I use. I love their delicate and simple beauty, referring to nature or the rythm of seasons. First I hunt for antique fabrics and pick the ones that I find most special for some reason. 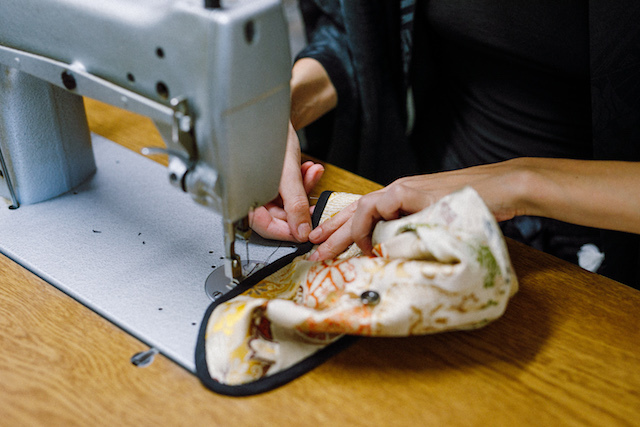 Next I start designing my item with the fabric – I usually start with a natural element from the pattern to design the first shape, like a leaf or landscape. Then I start playing with the shape by folding and cutting, and I add functional details. All my designs are unique but have one thing in common: I always try to reflect some of Kyoto’s esthetics and energy in all my items. For me it’s a craft from the very first idea to the final product. I love every part of the process. I’ve been advised many times to simplify production and produce much larger quantities, but I cherish the personal way I do it. I feel connected with each and every item, which I create from scratch. What message would you like to convey to the person wearing your items? I guess you will be seduced by my creations if you have a bit of a collector’s mind, if you are attracted by rarity and uniqueness. On the other hand I hope my items will naturally accompany you, enhance your look with sophistication without being ‘loud’. Yes the fabric is gold, it is very precious but that’s also one reason why these textiles were wasted in the first place. People tend not to wear these treasures anymore because they have rich meanings and codes and it can be intimidating or too much for younger generations. For me this is even more a reason to wear these special ancient fabrics in your daily life, blend them with your own style. Make them come to life again! You can buy your dream piece in Clémentine’s online shop (worldwide shipping). Stay tuned on her collection and promotions through Instagram @mikan_by_clementine.